Observation - Rose's 3rd spot submitted on 20th May 2009 - UK and Ireland. 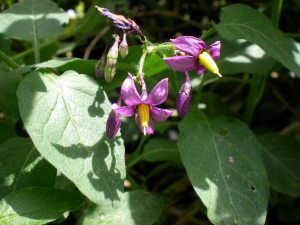 Description: Woody Nightshade also known as Bittersweet is the most common of the Nightshade family. It scrambles through hedges and shrubs, entwining the branches. This plant is also a source of a drug used for skin diseases and chest problems. Woody Nightshade also known as Bittersweet is the most common of the Nightshade family. It scrambles through hedges and shrubs, entwining the branches. This plant is also a source of a drug used for skin diseases and chest problems.